Being a Leeds Active School and a member of the Leeds North West School Sport Partnership provides the school with opportunities to take part in a variety of inter-school festivals and city wide competitions as part of the Sainsbury’s School Games programme. As well as this, each class in Key Stage 1 and 2 takes part in a festival at the local Secondary School, Prince Henry’s Grammar School during the academic year. We believe that Physical Education develops pupils’ physical competence and confidence providing them with opportunities to be creative as individuals, encouraging healthy lifestyles, while supporting their emotional well-being. We were proud to have been awarded Silver for the Leeds Quality Physical Education Award in 2014 and Gold for the School Games Mark in July 2016. Since 2013, every primary school has been given extra money in their budget to spend exclusively on PE. The following documents explain how the money has been spent at St. Joseph’s and the impact it has had. It was our first session of swimming this week and year 3 were so excited. While we were there they were very sensible and had lots of fun in the swimming pool. The whole school gathered in the hall to take part in National Fitness Day. All the children took part in a Samba routine with Samba rolls, Samba shimmies and Carnivals waves. The children had great fun and one child was heard saying at break time "I can't stop doing exercise – it's so much fun!" A huge thanks to Mrs Harvey for organising a fabulous morning! Well done to all the children who took part in the Cross Country on Saturday 4th October at Middleton Park. All the children finished in the top half of their races and showed real determination. Well done to all the children who took part in the Athletics event at PHGS on Thursday night. The event included: running, hurdle & obstacle relays as well as different field events- speed bounce, various jumps, chest push and javelin. All the children competed with determination and I was particularly impressed with their baton handovers (something that experienced athletes sometimes struggle with!) as well as their excellent support for their fellow team mates. It was an exciting couple of hours with some really close finishes and I am proud to say that we finished 2nd overall. This year, we have extended our links with Prince Henry’s Grammar School and in addition to the children attending festivals, each class will also receive coaching from a specialised Secondary School PE teacher. This year, classes will also receive coaching from a specialist PE coach provided by Inspiration Tree. On Thursday 22nd September children from Years 4, 5 and 6 took part in the Active School Cross Country event at Wharfe Meadows, Otley. In the sunshine, the children performed extremely well and we had lots of success. Our Year 4 and Year 6 girls teams, along with the Year 5 boys team have qualified for the next round. In addition, Jessica Rawstron (Y4), Ned Gallagher-Thompson (Y3), Sadie Bentham (Y6) and Charlotte Rawstron (Y6) all qualify individually. The next round will be held on Thursday 2nd March at Middleton Park, 1pm - 3pm. On Thursday 2nd March many amazing children from yr6,yr5 and yr4 took part in the qualification cross country for the winter games . all the children ran exceptionally especially in the harsh weather, the first runners were year 4 girls including Jessica Rawstron, Edie Stokey and Niamh Casey. The year4 boys were represented by Ned Gallagher- Thompson. Yr5 boys were represented by Ciaran diamond, Daniel Hornby, Thomas reavey,William morgan and jack stokey, lastly the year 6 girls , amber teale , charlotte rawstron , paris Sutcliffe and Sadie bentham . Year6 girls, Charlotte Rawstron and Sadie Bentham have made it to the cross country finals were they will be representing west Yorkshire. Thursday 1st December saw some of our St Joseph's athletes compete in the final of the Indoor Athletics Plate competition. We had qualified for this competition as we had competed so well in a previous meet. Therefore, we were up against some very good schools. As the events began, it was clear that our children were well 'up for it' and determined to do well. All of the children performed magnificently and competed in the right spirit. In a really tight contest, we finished the events in a superb second place and therefore qualify for the Leeds semi-final which will take place after Christmas. A massive well done to all the children who took part and a big thank you to the parents who came to show their support. On Monday 23rd January, 9 of our Year 5 children took part in a basketball festival at Prince Henry's Grammar School. Our children played 4 games, winning 3 and drawing 1. The children were fantastic, played like a team and won praise from many of the other coaches and parents. Due to their superb performances, our children have qualified for the Leeds schools basketball finals in March. Well done! On Thursday 14th, 10 of our best athletes attended a mini Olympic event at The John Charles Centre for Sport. The children were from Year 5 and took part in a 7's rugby tournament and an afternoon of athletics. They performed well in the rugby, winning the 6 group games. However, they were very unlucky to finish runners-up, losing to Drighlington in the final. In the afternoon our children used their rugby disappointment as athletic motivation. The children performed magnificently and were victorious in many of the events. The children's talent in the running events was clear for all to see and even attracted media coverage. The children were fantastic throughout the whole day and represented our school beautifully. On Wednesday 13th July, all of Year 4 took part in a Cricket Festival at Old Mods Cricket Club. The children enjoyed receiving coaching and playing matches against other teams. On Saturday 9th July, the school held its first school swimming gala at Aireborough Leisure Centre. There were a variety of different races and activities so that all children could take part in the event. The eventual winners were the red team. A big “Thank you” to everyone who helped organise the event. Our annual Sports Day, took place on Wednesday 22nd June. There were a variety of races: sprint, obstacle, hurdles, egg and spoon to name a few. Well done to the green team who were the overall winners this year. Year 3 had a lovely time at Ilkley tennis tournament last Thursday. 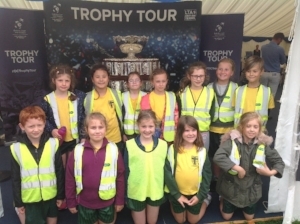 They enjoyed practising their tennis skills first before watching some ladies doubles and finished off the trip by seeing the Davies Cup Trophy. Our theme week for the summer term was the “Olympics”. Our week started with an Opening Ceremony with each class representing a country from a different continent. We also assembled our Olympic flame. During the week, the children took part in lots of different sporting events and coaching including: cycle racing, triathlon, archery, taekwondo and Samba dancing. At the end of the week we then had a closing ceremony celebrating the children’s achievements. In the summer term, Year 5 and Year 6 received hockey coaching from a local club, which the children enjoyed. Year 3 and Year 4 received cricket coaching during the term as well. During the summer term, there were several football events for children in Key Stage two, including: 5-a-side tournaments at Pool School, St. Bart’s Cup for girls and the Year 6 Catholic 7-a-side tournament. On Friday 13th May, we entered the under 11 cricket festival at Pool Cricket Club, winning the competition and qualifying for the next round. Just before the Easter holidays, all of Year 5 took part in a Rugby Festival at Guiseley Rangers Rugby Club. All the children enjoyed practising their skills and played really well. On Tuesday 8th March, a group of children from all classes in Key Stage Two took part in a Cross Country event at Wharfe Meadows with the Year 5 Girls and Year 4 Boys teams qualifying for the West Yorkshire School Games. On Wednesday 2nd March, after weeks of practising, Year 4 took part in a skipping festival at Trinity University where they won the Gold for their skipping dance routine. On Friday 26th February, two teams from Year 5 and Year 6 went to the sports park at Weetwood to play in a hockey festival. Both teams did really well and developed their skills. Children in Years 3 – 5 took part in two different tennis competitions this term. The first was where they played mini matches against other children and the second event was where they had practised their skills at different activity stations. Children from Year 4 and Year 5 took part in a Basketball Festival at PHGS which they won and qualified for the Finals. After the finals, some of the children stayed behind to watch Leeds Force Basketball team play a match. For the first time this year, we entered the Leeds School Cross Country League which is a series of races taking place on Saturday mornings over the autumn and spring term. The girls' team finished 8th out of 22 schools and the boys' team finished 15th out of 24. In November, a group of children from Key Stage 2 took part in the Sportshall Athletics Competition and qualified for the next round of the competition. In October, children from all classes in Key Stage 2 took part in two table tennis festivals trying a new sport. A group of children from Years 4, 5 and 6 took part in the Brownlee Triathlon on Monday 28th September. The children absolutely loved it and got to meet both Jonny and Alistair. Our school was lucky enough to win Rugby World tickets for 3 children to go to see Italy vs Canada at Elland Road. Some of our children were also able to take part in the Rugby Roadshow event in Millennium Square. At St Joseph's, the Physical Education provision is broad and balanced throughout both Key Stages. The children have access to 2 hours of high quality Physical Education weekly, following the national curriculum and covering the four main areas of PE: games, dance, gymnastics and athletics. We offer a wide range of extra-curricular activities throughout the school day. 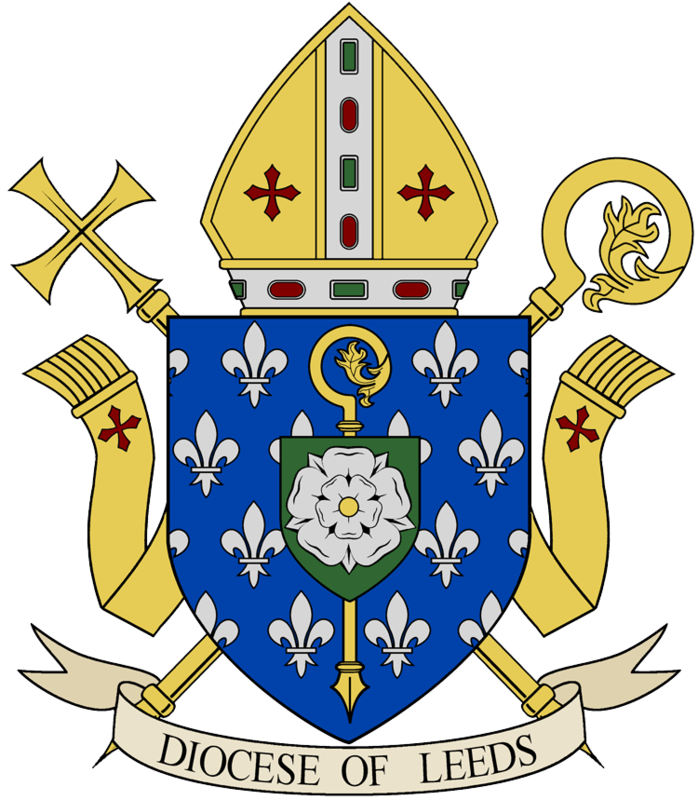 Being a Leeds Active School and a member of the Leeds North West School Sport Partnership provides the school with opportunities to take part in inter-school festivals and city wide competitions. We believe that Physical Education develops pupils’ physical competence and confidence and provides opportunities for them to be creative as individuals, encouraging healthy lifestyles, while supporting their emotional well being. We were proud to have been awarded Silver for the Leeds Quality Physical Education Award in 2014 and Bronze for the Sainsbury's School Games for the past two years. They performed well in the rugby, winning the 6 group games. However, they were very unlucky to finish runners-up, loosing to Drighlington in the final. Children from Year 5 and Year 6 took part in the Brownlee Triathlon at the John Charles Centre for sport on 1 October 2014. Johnny Brownlee started the children off in the swimming and Alistair Brownlee presented the children with a medal at the end of the event. What a competitive day! Red, Green, Blue and Yellow competed in a variety of races - obstacle course, egg (really a potato) and spoon, hurdles etc to be the winners of this year's sports day. There were tense moments at the finish line. Once all the points were totaled, Blue were the overall winners with Yellow coming in second; there were only a few points in it. Green were in third place followed by Red. On Tuesday 3 June 2014, Mrs Murphy held a Sainsburys Your School Games intra-school sports competition for Key Stage 2. Years 3 and 4 competed in Hockey, Football and Basketball and year 5 and 6 competed in Basketball, Rounders and Boccia. Year 10 Sports Leaders from St Mary’s Menston came to help score and officiate on the day. The overall winners on the day were the Blue Team. Reception had a visit from a tennis coach who introduced them to playing tennis. They practised their racket and ball skills. On Tuesday 11 February 2014, Mrs Murphy held an intra-school sports day. Each year group took part in a Gymnastics competition. Year 10 Sports Leaders from St Mary’s came to help score and officiate on the day. The overall winners on the day were the Green Team. Well done to everyone who participated. Amanda Murphy and Helena Harvey (PE Co-ordinator) has attended a CPD workshop on Ofsted and applying for Kitemark and Qualitymark awards. On Tuesday 22 October 2013, Mrs Murphy held an intra-school sports day. Each year group took part in a range of competitive athletics and bench ball activities. Year 10 Sports Leaders from St Mary’s Menston came to help score and officiate on the day. The overall winners on the day were the Blue Team. Well done to everyone who participated. Staff from St Joseph’s have attended CPD training in Tag Rugby and Gymnastics organized by staff at St Mary’s Menston.